Increasing supply of electrically power assisted bicycles system kits to Europe - News Releases | Yamaha Motor Co., Ltd.
Yamaha Motor has begun supplying system kits for electrically power assisted bicycles to two bicycle manufacturers n Europe - German bicycle manufacturer Winora-Staiger GmbH (a subsidiary of Dutch company Accell Group N.V.), and CycleVision A/S (a subsidiary of Danish company HF Christiansen A/S). Winora-Staiger's main market is in Germany, while CycleVision's main sales network is in France, the Netherlands, and Belgium. The system kit for electrically assisted bicycle comprises a drive unit, a battery, a display, and a charger. Yamaha will also supply design parts such as plastic covers if required. Since the commencement of trade with Giant Electric Vehicle (Kunshan) Co., Ltd. last year,* we now supply three customers with the system kit. The demand for electrically assisted bicycles in Europe (also known as e-bikes・ reached our expectations of 850,000 units in 2012, making Europe one of the major markets for electrically power assisted bicycles. Germany and the Netherlands comprise over half of the European market. 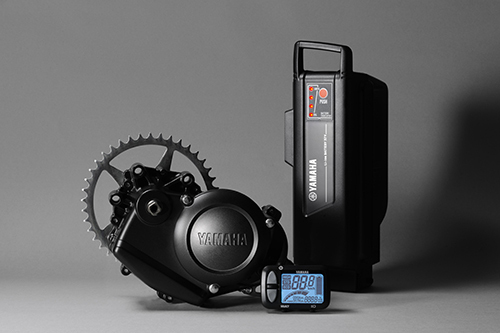 As part of our growth strategy, Yamaha will strengthen and expand partnerships with bicycle manufacturers in Europe, developing a global business as a supplier of electrically power assisted bicycle system kits to complement our domestic sales of electrically power assisted bicycles and supply of drive units. Our target is to supply 100,000 units to Europe by 2015. *Only the drive unit is supplied.